Ran for the duration of the RWC 2015. Has since been taken down. We were tasked with designing a companion for the 2015 RWC. 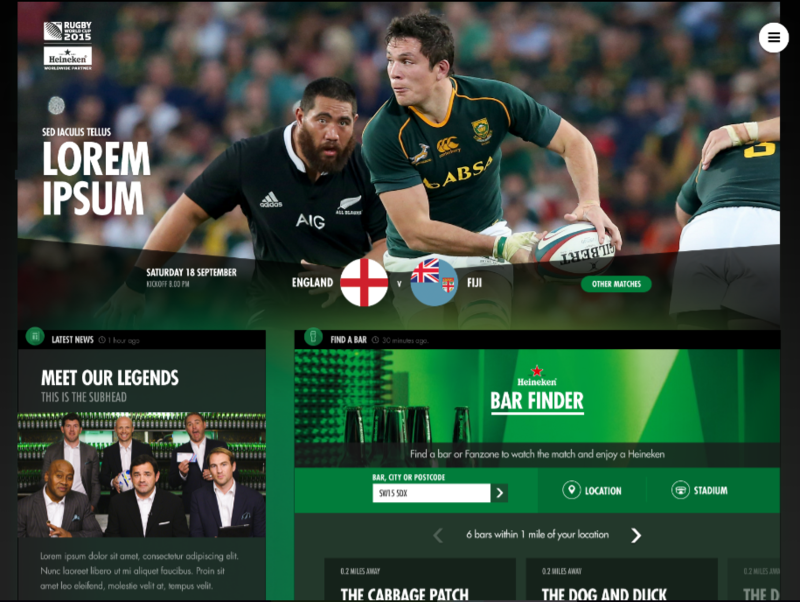 It had to provide timely, relevant information to rugby fans across the world, to keep them informed, entertained, and enable participation in competitions etc. A feed-like hub of information which relied very heavily on timely publishing of content, from interviews and predictions in the run up to big games, to analysis and highlights after games. We didn't want users navigating a complex structure or losing their place in the feed, so all content was presented within the feed using hide/reveal methods. Careful consideration also had to be given to avoiding spoilers for those who hadn't yet watched games. Interspersed throughout were competition mechanics and other mechanisms such as polls to get the user involved with a more interactive experience. Working with a designer and technologist we sketched and specced in utmost detail the structure of the site, from navigation, search etc and then created a set of flexible components that could stack on top of each other as the content within the feed grew. Some components were flat content, others such as videos, galleries, polls, feature length articles and final scores were more interactive and required careful consideration of micro-interactions.